During October, I was following along (some of the time) with #WIPjoy (Work In Progress Joy) by Bethany Jennings, on Twitter, answering the prompts I wanted to answer, with The Siren and the Skyship, my NaNo novel. I’ll be muchly busy with NaNo, and I know I haven’t replied to some comments and haven’t done much blogging because I’ve been busy trying to prep for this month-long writing adventure and had other road blocks like colds and computer issues, BUT I STILL LOVE YOU, I PROMISE. I do have some blog things coming up and hope to catch up on comments and things very soon. BRB, have a novel to write. Day 1: Introduce your WIP! Day 5: Ask a question other writers might be able to help with! Day 9: How would your MC use Twitter? Day 14: Who is the MC’s best friend? Princess Tasmania's best friend is Noya, a loyal gal. Day 19: Your biggest daydream about this WIP’s future. #WIPjoy 19: My biggest dream for The Siren and the Skyship? Day 20: When your WIP is a movie, what would the credits sequence be like? Day 22: Antagonist – Favorite snack food? #WIPjoy 22: Favorite snack food? Antagonist: The souls of my victims. Antagonist: That is to say… smoked poultry. Day 23: Protagonist – Last dream you had? Day 24: Side character – Is the author evil? #WIPjoy Day 24: Question for a side character: IS the author evil? Me: O_O Um. >.> Well. Day 25: Antagonist – What’s something that keeps you up at night? Question for Antagonist: What keeps you up at night? Sorcerer of the Mist: That, my dear, is none of your business. Day 26: Protagonist – How do you like to celebrate your birthday? Princess Tasmania: Cake. Tea. Dancing. The works. Auren: Flying in the clouds? Day 27: Side character – Your secret vice? Rook: I work too hard. Tasmania: *snorts* Not so secret. R: Fine, YOU come up with one. T: He won't ask for help. Day 28: Protagonist – Worst way to die? #WIPjoy 28: Worst way to die? Rook: Without something to fight for. Day 29: What’s something that’s creepy in your WIP? Day 30: How do your characters celebrate Halloween (or other holiday), if they do? Day 31: Your dream cosplay from your WIP! #WIPjoy 31: Your dream cosplay from your WIP! The Noble Servant is a retelling of The Goose Girl (with nods to The Prince and the Pauper as well), which is not a fairytale I’m as familiar with as some, although I know the general idea of the servant taking the place of her lady and forcing the heroine to become a servant tending to geese. I enjoyed the retelling aspect but likely didn’t pick up on as much of it as I might have if it was a different fairytale. But far from making it less enjoyable because of that, I actually enjoyed it immensely because I had no idea what was going to happen! It was exciting at times, and absorbing all throughout, and had a few surprise twists which I did not see coming! Especially with a few of the side characters surprising me. So that was neat. 🙂 Something about it felt a little different than Melanie Dickerson’s previous books, I felt, but not in a bad way. It was just… kind of new. 🙂 While still being slightly similar in a good and familiar way. 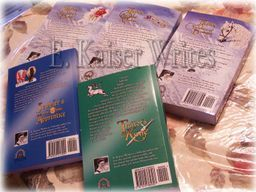 Like I said, I wasn’t ever sure what would happen next, and the writing was extremely well done, and kept me turning pages all throughout the book, eager to find out how our sweet heroine and dashing hero would get out of their predicaments, with God’s help, and maybe find a little love along the way. 😉 I couldn’t stop reading and was captivated until the final page. I can’t think of anything specific that I disliked. Occasionally it gets very slightly exasperating how long it takes the hero and heroine to actually let on that they like each other and get over their worries about not being worthy etc., but that seems to be a classic romance theme, so oh well. 😛 And it didn’t annoy me as much as sometimes. But she might just gain what she’s always wanted . . .
New York Times bestselling author Melanie Dickerson beautifully re-imagines The Goose Girl by the Brothers Grimm into a medieval tale of adventure, loss, and love. This last week, an exciting new release happened… Once: Six Historically Inspired Fairytales, an ebook box-set collection of half a dozen novellas by six different authors! A lonely girl plots revenge in the shadow of a mountain. A stolen princess fumbles a century backward. A dwarfish man crafts brilliant automatons. A Polish Jew strikes matches against the Nazis. A dead girl haunts a crystal lake. A terrified princess searches a labyrinth. A rich collection of six historically inspired retellings, Once is a new generation of fairytales for those who thought they’d heard the tales in all their forms. Six interesting retellings of six different fairytales by six skilled authors. I found each of these to be unique and very well written, although each of them are quite different from each other, and I enjoyed some more than others. Overall, a quite good collection of tales! Here are my thoughts on each. This one started out a little slow, so I was nervous I wouldn’t enjoy it, but once it got intriguing I was hooked, and read the second half in breathless anticipation. The Little Red Riding Hood retelling part of it only came in near the end, but it worked really well and was unique. Not sure I’ve ever read a retelling of that one before! I haven’t read many westerns (I’ve seen a lot more. ;)) but I really enjoyed this one! It all felt super authentic — descriptions, dialog, characters… all of it. Rosa Jean was a well written character who I quite liked, and Quincy Burnett was awesome! The writing is detailed and skilfully firm — I could really see the setting, even if it made the beginning slow. Other than a quiet beginning and the fact that it took a little while for anything to be explained (including the fact that I automatically assumed Rosa Jean was a thirty year old woman whose husband had died… um, nope.. whoops), it was really good! This story was GOLDEN and I ADORED it and it was amusing and cleverly witty and fascinating and fresh and I was grinning the whole time I read it and it was a sparkling 5 star story… until the last second when everything crashed and burned and it ripped my heart out and left me DEVASTATED AND FURIOUS and I can’t say what happened because spoilers but IT WAS NOT OKAY AND I AM NOT OKAY AND I’M SO UPSET I CAN’T EVEN RIGHT NOW. 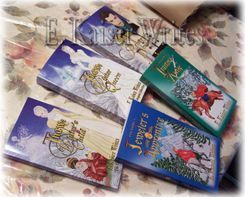 It was a modern-turned-time-travel-1897-Romania-Sleeping-Beauty-magical-gypsy-curse kind of story with a beautiful love story (most of the time), and was a magical, clever, fresh, funny, well-written, unique story, with so much personality and charm. I just loved it so much. Which is why it’s so tragic that the ending was… well… tragic. It’s not a fairytale romance, it’s a tragedy. And I need my happy endings or else I’m a heap of displeased as high as Mount Everest. So that was super disappointing, even though the rest was really good! BUT IT MADE SAD AND ANGRY AND UGH. I just… don’t know what to rate it, since half of me says to give it 5 stars (or at least 4… knocking one off for the ending), and the other half of me wants to rate it 1 star and not even be sorry and howl from the rooftops how such an ending is so many levels of not okay. Bad endings tend to cancel out good stories for me. Plus, I expected something else to happen with Ioan, and it never did? There were a bunch of unwrapped-up things like that. I just… I really thought the ending would come together into something clever and interesting and happy and then it DIDN’T. Lost opportunities, IMHO. Um. I’ll just be over here in a corner feeling conflicted and royally distraught. This was a Rumpelstiltskin retelling with a steampunk/sci-fi twist set in an alternate-history America (really intriguing, but I wish we’d learned more about it in the story than we did). It was much more like the original fairy tale, in terms of plot layout, than any of the other stories in the collection, but I actually loved that because it made the differences, despite the similar framework, stand out a lot more strongly. Because this story was SO Rumpelstiltskin, and yet SO twisted around and fresh and different. The writing is brilliant but also down to earth. The characters were real and interesting. I liked Amanda, and Byron, what was seen of him, was great. It almost felt like a Beauty and the Beast story occasionally, which was actually cool. There were mysteries which kept me guessing, and I stayed on the edge of my seat for most of the story, immersed and reading as fast as I could, wondering how it would all turn out. This is one of those “it’s not you, it’s me” things. I knew from the start that this would be a story that would not be a favorite. World War II, The Little Match Girl, first-person-present-tense, tragic love story, with a lot of darkness and grimness, and favorite character dying, and no happy ending in sight… Those are like some of my least favorite things ever, all rolled in one (seriously, it’s only missing dystopia and zombies. XD) so I knew it just wasn’t my thing. But I admit I was surprised how sweet the romance was and how beautiful the writing was (in some of the flashbacks, anyway), and I could see why it was written how it was (the flashbacks, which are actually most of the story, are in past-tense, so it made sense to tell it that way), and Romek was the best (*sadnesses*), and it was gripping despite not being my thing. So I’m giving it an extra star for being well-written and having some good things like that. I just… why can’t stories have happy endings? -_- Anyway, I’m sure many people will enjoy this one, it just wasn’t for me. I just don’t enjoy tales that are hopeless and depressing, no matter how well-written they are. Just my personal preference. I wasn’t sure what to think about this one for awhile, but it surprised me by drawing me in and I ended up really enjoying it! It’s more of a thriller, murder-mystery type story, and much of the time you don’t know who to believe or trust, which only added to the suspense and mystery. Normally I really dislike stories which leave out key bits of information that we ought to know but for some reason I didn’t mind in this one. I guessed a lot of things, but despite that the mystery kept me on the edge of my seat. The heroine, Ruby Black, was somewhat strange and I wasn’t sure if I liked her at first, but I found that didn’t really matter because by the end the characters were so real to me that I found “liking” or not had no say in the matter. They just… were. The other characters were interesting too, particularly Max, who we saw the most of besides Ruby, and who I was really kept on my toes wondering about. There was also some poetry and imagery woven in, which only added to the ethereal feel. It was exciting and beautifully written, and the tiniest bit eerie, but in a way that didn’t bother me. I just… really really liked it! 🙂 Which surprised me, because it started out a little rocky and I wasn’t sure if I’d enjoy it. I’m so glad I kept reading! Somewhat haunting and gorgeous and strange and unique, and I liked the clever fairytale twists in it. Another favorite! A retelling of Rapunzel, set in Renaissance Italy, this story was like golden sunshine and I LOVED it. What if Rapunzel (in this story, Nella) didn’t want to leave her tower? It starts out a much lighter-hearted story than the rest, but it has its share of reality and war and adventure and peril as well. All of that comes later, but first we must meet quiet Nella, and two princes who are SO much fun to read… seriously, the dialog in this story is FANTASTIC. It’s mostly about Nella, who’s odd but nice and has to face many fears, and Prince Benedict, who is just… asldkjflk HE’S GREAT OKAY. The humor in this story is superb and had me laughing aloud several times, or just grinning and grinning, quite unable to stop. The banter Benedict has with Nella, and with his brother (seriously great brother scenes with Benedict and Orlando, even if there weren’t a lot) just made my day. In a way it’s a simpler plot than some, but it was just so refreshing and fun and gorgeous and I adored it. ❤ When war threatens and peril engulfs our main characters, they must be brave and press on in the face of adversity, with only their love, ingenuity, and faith to guide them. I just… *flailing* I don’t even think I can think of anything I disliked about it. IT WAS AWESOME, OKAY? The perfect note to end this collection on, it left me grinning and beaming and just so happy. ^_^ This story is the BEST. EVERYONE, READ THIS COLLECTION IF JUST FOR THIS STORY! What’s the occasion? I’m glad you asked! At long last her available novels — previously available only in ebook editions — are releasing in print today, which is super exciting! EEEK I love seeing them in “real” form here… So pretty! 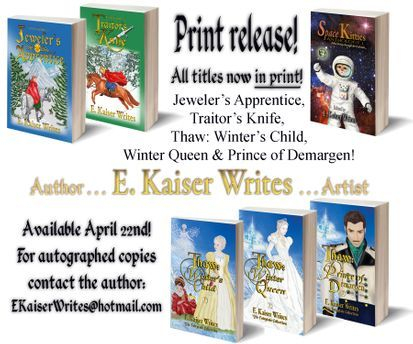 Today also marks the launch of the new ebook editions (also available in print) of the first two books of the Five Gems series, Jeweler’s Apprentice and Traitor’s Knife with new covers — aren’t they pretty? On her first visit to the palace 16 year old Fia Brithin stumbles onto a court secret. To keep the secret safe, the Chancellor sends her off as apprentice to a famous, reclusive, high mountain jeweler. Discovering gems with deep secrets and new friends with the same, Fia learns a whole lot more than just making wax models. She learns… When to trust a stranger, and when not to; why not to try stealing from gem thieves; what heroism is, what royalty ought to be, and that the mountains themselves can sometimes be the greatest danger of all. When the loyalist cause enlists the mountain house into a weaponry, young apprentice Fia is confronted with three refugee children, a disturbingly upstart former messenger, and accidents happening everywhere. Are saboteurs out to nix the weapons works… or is it her friend, Othira’s incognito crown prince they’re after? 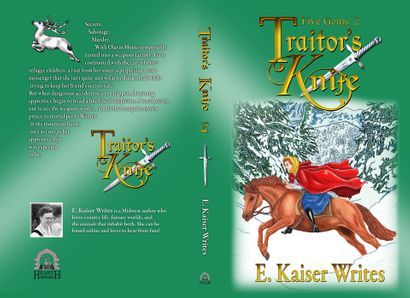 Traitor’s Knife continues where Jeweler’s Apprentice ended, and nearly seventeen year old Fia Brithin from the foothills still has a lot to learn about the mountains, and the people now in them. A barren king and queen pray for a child, and when in their loneliness, they make one out of snow, their prayers are answered in a special, and unusual way. Sometimes, when we get what we wish for, we don’t know what to do with it. A slightly pampered girl allows her avoidance behavior to isolate her from the world… it’s only when she takes the final step that she realizes the wall she’s built in the name of safety is also the one that will hold her prisoner forever… unless she discovers how to destroy it. The only one who can break a neurosis… is the one who has it. The whole world knows his guilt, and is absolutely correct about it, but how far can a man go to regain respect so swiftly lost? Or is an honorable death the best a fallen star can hope for? The only person who can help him… is the one he most deeply wronged.